When the first commercial telephone exchange began service in January 1878, teenage boys were hired as the first operators. However, the young men often played pranks on each other and their customers. Within about six months, the Boston telephone exchange decided to add a female operator, a young woman named Emma Nutt. The response was overwhelmingly positive. 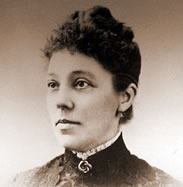 Customers were so pleased by Nutt's soothing, cultured voice that the rough shouts of all the boy operators were soon replaced by more and more women's voices -- including, in 1879, that of Misses Bessie Snow Balance, Emma Landon, Carrie Boldt, and Minnie Schumann, the first female operators in Michigan. Men were reintegrated into the Operator workforce in the 1970s. Emma Mills Nutt proved herself a better fit for her position than her male coworkers when she became the first female telephone operator today (Sept. 1) in 1878. Once the telephone began to migrate into the mainstream, the newly founded telephone companies needed to hire people to run their switchboards. Following the precedent established by the telegraph companies, they hired boys, who had proven themselves to be skillful telegraph operators. It nearly ruined their business. The boys were extremely unruly. They had little patience with callers, speaking to them rudely and even cursing at them, and would make prank calls in their spare time. Callers were less than pleased, so telephone companies decided to hire a female operator and see if she might help calls to run more smoothly. In January 1878 the Boston Telephone Dispatch company had started hiring boys as telephone operators, starting with George Willard Croy. Boys (including reportedly Emma's husband) had been very successful as telegraphy operators, but their attitude (lack of patience) and behaviour (pranks and cursing) was unacceptable for live phone contact, so the company began hiring women operators instead. Thus, on September 1, 1878, Emma was hired, starting a career that lasted 33 or 37 years, retiring in 1911 or 1915. A few hours after Emma started work her sister Stella Nutt became the world's second female telephone operator, although, unlike Emma, she only stayed for a few years. The customer response to her soothing, cultured voice, and patience was overwhelmingly positive, so boys were soon replaced by women. In 1879 these included Bessie Snow Balance, Emma Landon, Carrie Boldt, and Minnie Schumann, the first female operators in Michigan. Emma was hired by Alexander Graham Bell who is credited with inventing the first practical telephone; apparently she changed jobs from a local telegraph office. She was paid a salary of $10 per month for a 54 hour week. She, reportedly, could remember every number in the telephone directory of the New England Telephone Company. To be an operator, a woman had to be unmarried, between the ages of seventeen and twenty-six. 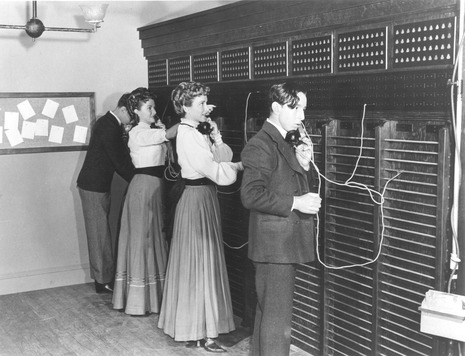 She had to look prim and proper, and have arms long enough to reach the top of the tall telephone switchboard. Much like many other American businesses at the turn of the century, telephone companies discriminated against people from certain ethnic groups and races. African American and Jewish women were not allowed to become operators.